Butterfly Magnet cut from a pop bottle. This painting activity helps reinforce the concept of symmetry while creating a useful gift from a empty pop bottle. Butterflies can be used to hold pictures and lists on the fridge or can decorate the interior of the family car. Students love to make lots of these beautiful butterflies so save lots of bottles for this activity. Use this “master” to trace more copies on the pop bottles. Cut out all the butterflies (unless you have an older class who can do it neatly by themselves). Bend the wings of the butterflies so that they have a body in the centre and the wings lift up slightly on each side. 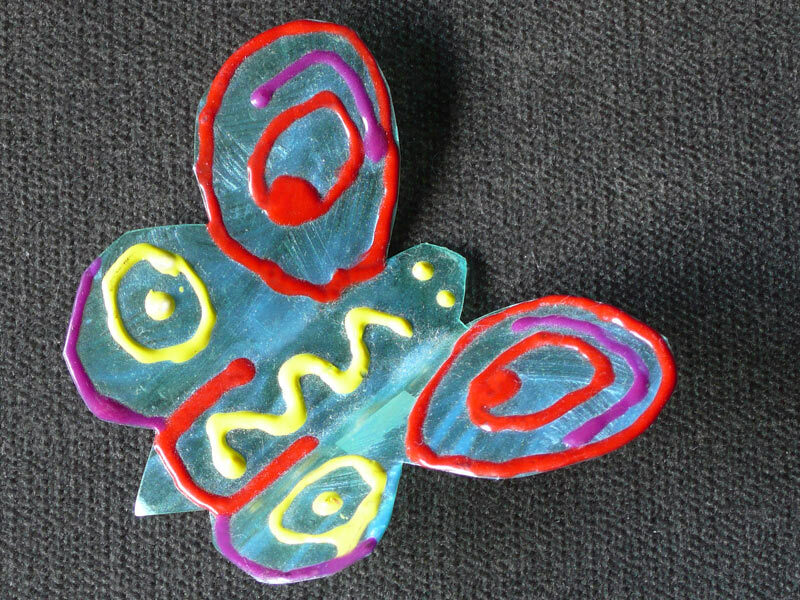 Cut strips of magnet to fit along the underside of the body and glue them on each butterfly (unless you have older students who can do this and get the polarity correctly, otherwise your magnets won’t stick). Ahead of time, paint a sample butterfly for the class to see a finished product. At the beginning of the lesson, we talk about symmetry. You can talk about magnetic poles, attracting and repelling, etc. at this time as well, if you like. Then I print my name in pencil on the magnet that is attached under the butterfly, instructing students to do that as well. Next, I paint a sample butterfly to show them how to paint it symmetrically. I do a design on one wing, then the identical design on the other wing. I remind them not to put too much paint on the wings or the paint will drip. Less is better. Completed butterflies are put on a ledge or shelf to dry for a day. Butterflies can be used to decorate a bulletin board for spring, a math board showing symmetry examples, or placed on any magnetic surface for decoration until they are taken home. Students can give these as gifts for Mother’s Day in May, Earth Day in April, Environment Week in May/June, World Environment Day in June. Butterflies can be used to hold pictures and shopping lists on the frig or can decorate the interior of the family car. It’s a great lesson in reusing as well, showing them that they can reuse things to make great gifts. Students always love this activity and make very creative and beautiful butterflies.